Willa Cather came to Jaffrey, New Hampshire for the first time in 1917. While visiting her friends Isabelle and Jan Hambourg at the Shattuck Inn early that summer, Cather discovered a place that would become, as Edith Lewis notes, "the one she found best to work in." 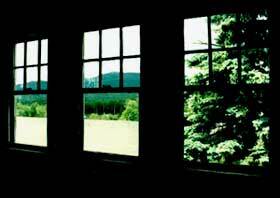 She settled into two rooms on the third floor of the inn where, from the windows of the end room, she had a view of Mount Monadnock and the surrounding woods and pastures. Two Pittsburgh friends who were renting a farm called High Mowing (not far from the Shattuck Inn) that same summer pitched a tent in their meadow, where Cather spent her working hours. It was in this earth-floored tent, containing only a table and camp chair—as Cather would describe years later in a letter to Harrison Blaine, the son of the owner of High Mowing—that she wrote much of My Ántonia. The following summer and fall Cather returned to Jaffrey, taking the same two rooms at the Shattuck Inn. By then My Ántonia was in galleys, which she and Edith Lewis read together, sitting against rocks in the woods near the inn. Cather would return to Jaffrey many times after those first two summers, usually from mid-September to late November in order to avoid the summer crowds. After her cottage was built on the island of Grand Manan, Cather would stop in Jaffrey for a few weeks before returning to her apartment in New York each fall. After the devastating hurricane of 1938, which destroyed the woods behind the Shattuck Inn, she returned to Jaffrey less often. Among the friends Cather made in Jaffrey was Dr. Frederick Sweeney. During the fall of 1919, while writing One of Ours in her tent at High Mowing, Cather became ill with the flu. While Dr. Sweeney was treating her, Cather discovered that he had been a medical officer on a troop ship bound for France, and that he had kept a diary. According to Dr. Sweeney's daughter Dorothy Sweeney, he initially refused Cather's request to read his personal accounts of the war. But Cather was persistent, and he eventually consented. Many of the details in Dr. Sweeney's record of an influenza outbreak aboard ship would later inform Cather's shipboard scenes in One of Ours. Before her death in 1947, Cather requested that she be buried in the Old Burying Ground behind the Meeting House in Jaffrey. Edith Lewis, with the help of the Austermanns (daughter and son-in-law of the Shattucks), made the arrangements. Cather's simple gravestone sits near a wooded area on the edge of the cemetery near clusters of rhododendron bushes. Bean, Margaret C. "Willa Cather in Jaffrey." Teaching Cather (Fall 2002) 17-18. Jaffrey Center New Hampshire: Portrait of a Village. Jaffrey Center Village Improvement Society, Inc., 1976. Lewis, Edith. Willa Cather Living: A Personal Record. New York: Alfred A. Knopf, 1953. A Survey of the Historical and Architectural Resources of the Town of Jaffrey, N.H. Jaffrey Historic Commission, 1986. Letter: Willa Cather to Harrison Blaine, 9 June 1943. The Jaffrey Public Library, Jaffrey, New Hampshire. Jaffrey Center Historic District Allow at least one hour to tour the Jaffrey Center Historic District, or a full afternoon to visit all the sites listed. For additional information, contact the Jaffrey Historical Society. (603)-532-6527. The cemetery known as the Old Burying Ground, where both Willa Cather and Edith Lewis are buried, is located behind the Meeting House in the historic district. Established in 1970, the historic district's restored buildings and open land convey the evolution of a New England village over more than 225 years. Other buildings of interest: the Brick Church (1831), the Little Red School House (1822), the Old Manse (1787), and the Melville Academy (1833, now a local history museum). The historic district is located on both sides of Gilmore Pond Road, off Rt. 124. Woodbine Farm (High Mowing). In 1917 when Cather pitched her tent in a meadow on this property and wrote sections of My Ántonia, High Mowing was owned by James H. Robinson, a professor of history at Columbia University. Mrs. Robinson rented the house to two friends of Cather's from Pittsburgh, Miss Lucy Hine and Miss Acheson. High Mowing was bought by Mrs. Graham Blaine in 1926-27. The cottage and barn, built in 1930-31 by Mrs. Blaine, are visible from the road. The main house, built in 1899, is not. Located on the west side of Thorndike Pond Road. The Jaffrey Civic Center. Houses historical displays created by the Jaffrey Historical Society and a gallery that showcases local artists. Located on Main Street in downtown Jaffrey. Jaffrey Public Library, 38 Main Street, Jaffrey, NH, 03452-6144 ( map) 603-532-7301, Library Hours: Mon, Wed, Fri. 11- 5:30, Tues. and Thurs. 1 -8 and Saturday 9 -1. Route 2 West to exit 24B to Route 140 North. Follow to Route 12, take a slight left onto Spring Street (Rt. 12). Turn right onto GlenAllen Street, which becomes 202. Follow Route 202 North into New Hampshire to Jaffrey. Take a left at Route 124 (Main Street), follow for approximately 2 miles. The historic district is on the right. I-91 North (in Massachusetts) to Exit 28A, Route 10 (toward Northfield). Follow signs to NH, to Winchester. Take a right onto Route 119 East. Follow through Fitzwilliam and Rindge. Take a left onto Route 202 North and follow to Jaffrey. At Route 124, take a left, follow for approximately 2 miles. The historic district is on the right. Route 101 West into Peterborough, NH. Take a left onto Route 202 South into Jaffrey. At the first light, take a right. At the second light, proceed straight on Route 124 West for 2 miles. The historic district is on the right. The Currier's House , 5 Harkness Road, Jaffrey Center, NJ 03452 603-532-7670, Proprietor: Nancy Lloyd. Located only a few hundred yards from the historic center and the Meeting House.